My recent message, which included the text of Congressman Ron Paul’s Statement on Competing Currencies, drew a flurry of responses, some positive and some negative. That’s fine because now I know I’ve got people’s attention. Now I would like to explain why I think his message is so important and why I decided to circulate it. There are several good reasons I did not mention in my introduction. I intended from the start to write a detailed critique of Congressman Paul’s monetary agenda, but I did not want to delay its circulation. I’ll include at least a portion of that critique toward the end of this message. I will outline what I agree with and what I disagree with, adding some points about implementation strategies that I think have better chances of success than the political approach which Congressman Paul and other monetary reformers find it difficult to see beyond. The truth of Lord Acton’s warning that “power corrupts” becomes more evident every day, so anything that enables the ever-increasing concentration of power must be exposed and disabled. Although it is not widely recognized, the monopolistic control of the money system is primary among these. 1. Ron Paul’s message has made the money issue, for the first time in decades, part of the mainstream political dialog. His candidacy for the office of president, and his demonstrated ability to raise significant amounts of money from a grassroots constituency have attracted some mainstream media attention, enabling his statements on money to get some major exposure. 2. Congressman Paul’s statement explicitly exposes the fact that we have “a government-instituted banking cartel that monopolizes the issuance of currency,” and makes the case that competition in currencies is necessary to restoring democracy in America. 3. His statement calls for “eliminating legal tender laws.” People need to understand that legal tender laws play an essential role in empowering and enriching central governments and banking elites at the expense of the people and democratic governance. Legal tender laws amount to, quite simply, a license to steal. They enable the federal government to spend virtually any amount of money for wars and favors to crony corporations without regard to its limited tax revenues. Chronic deficit-spending creates debt that will never be repaid. It takes value out of the economy by diluting the money supply with legalized counterfeit. Eliminating legal tender is the single most important step in reining in abusive central government and restoring the balance of power. Do I believe that repeal of legal tender is a likely prospect? Under the present circumstances I put the probability at nil, as I do the chances of getting any kind of political solution to the money problem. But we must look ahead to a time when it will be possible to establish truly democratic government in which people hold power at the local level and the upward assignment of responsibilities is only provisional and temporary. Just as the separation of church and state was a huge step forward, which was enshrined in the United States Constitution, and is generally accepted as a fundamental tenet of democracy, so too the separation of money and state will need to be explicitly enshrined in a new or amended constitution. Under legal tender laws, which force acceptance of “bad money,” “bad money” drives “good money” out of circulation. In the absence of legal tender laws, the bad money will be rejected or discounted in the marketplace leaving in circulation only “good money,” money that people trust. 5. The Paul message includes some current and historical anecdotes that provide additional insights into the dimensions of the money problem. Specifically, he refers to various government actions that were designed to eliminate free exchange by shutting down competing exchange media. Anyone who seeks to establish community currencies or other alternative exchange processes, needs to be cognizant of these potential hazards. Anyone who has been following my work knows that I have repeatedly made clear my opposition to using gold as money. While gold (or silver) might serve as an objective measure of value, there is no need to revert to gold as a payment medium. But even in the role of value measure, gold has serious shortcomings, not the least of which is the fact that the market for gold is manipulated by the large holders of gold. I made these points in my 2007 Malaysia presentation http://video.google.com/googleplayer.swf?docId=-1399011433067824706&hl=en. 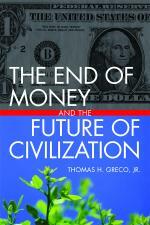 The exchange of real value, which money is supposed to facilitate, has evolved beyond money. This is the fact that the “gold bugs,” and almost everyone else, fail to recognize. As I’ve described in my presentation on The Evolution and Transformation of Money, the highest stage of evolution in the exchange process is direct credit clearing. This is a process by which accounts payable (resulting from purchases) are offset by accounts receivable (resulting from sales) within a circle of associated buyers and sellers. This approach has the added advantages of bypassing all the sales tax issues associated with using commodities, including gold, as exchange media. So, in brief, all kinds of “money” are obsolete. All that is required now is a system that provides for the democratic allocation and management of credit. If we insist on using the term money, we must say that money is nothing more than credit. The local, democratic management of credit and the establishment of networks that connect those local credit clearing entities into regional and global trading unions provides the means for establishing true economic and political democracy and a dignified life for all. This entry was posted in Basic Concepts, Developing Alternatives, The Political Money System. Bookmark the permalink. Thomas, thank you for clarifying (for many years) what money is and how we can make it better. The time is now. We can even now establish truly democratic LOCAL governments, that allocate and manage credit democratically. Here in Western Massachusetts we have designed, over the past six years, a new kind of bank and a related Depositors Association. Together, the bank and association constitute a well-heeled local government — able to create, grant and lend local currency that is seamlessly integrated with our existing economic system, without being tied to that system’s shortcomings. Our local currency design follows your recommendations faithfully. Once the first of these banks opens, communities will be able to start their own virtual common good bank™ system in a matter of days, with as few as 50 depositors. See http://commongoodbank.com. Thank you Tom this – for me – is just as important as Paul’s initiative.